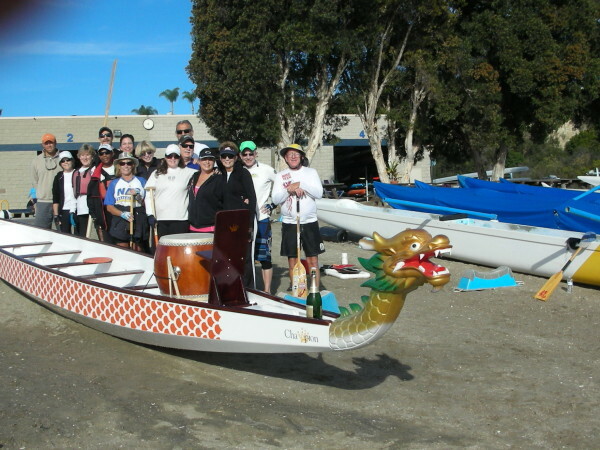 The team participates in both recreational and competitive dragon boat races that are sanctioned by the IDBA (International Dragon Boat Association), and CDBA (California Dragon Boat Association). We have competed as close to home as Long Beach and a far away as China. Each Spring, team members vote on which races we will attend that season. Whether you’re a novice or an experienced paddler, we welcome you to visit us for a free practice. See you on the water! Season Practice: Sunday’s 8:45am to 11am. Tuesday 6:15pm to 7:30pm (Daylight Savings Time) Once Daylight Savings changes, practices are held on Sunday’s only rain or shine. Price: An NAC Annual Membership is required and a one time fee of $200 for the Dragon Boat Team dues and $60/yr for NAC facility fees . Requirements: A desire to be a team player, to have fun, and to work out. NAC Dragon Boat Team christens their new boat!! Dragon Boating is an ancient Chinese Sport dating back to 278 B.C. At this time, lived Qu Yuan, an exiled poet and outspoken critic of the tyrannical rulers of the day. Upon hearing of an imminent invasion of his beloved home state of Chu, he picked up a heavy stone anchor and threw himself in the nearby Miluo River in an act of protest. Distraught locals raced to save him in their boats, but were too late. The Dragon Boat Festival is a national holiday in China and is held on the fifth day of the fifth lunar month (June or July). Its origins lay in commemorating the paddlers’ futile rush to save Qu Yuan. But today, far from a mournful occasion, it’s a boisterous celebration of sport, culture and international friendship. Races are held from May to September, all over the world. We compete in major nearby races as well as having journeyed to races in Vancouver, Canada and as far away as China. In the mid-1990’s, sports medicine therapists began noticing marked improvements in the recovery time and overall prognosis, for breast cancer survivors who had become engaged in the sport of Dragon Boating. Soon, these benefits came to the attention of the greater medical community. The sport’s ability to build core and upper body strength were cited among many of the physical benefits to those survivors working their way back to health. There’s no question as to the advantages of building strength and stamina as part of a complete therapy. 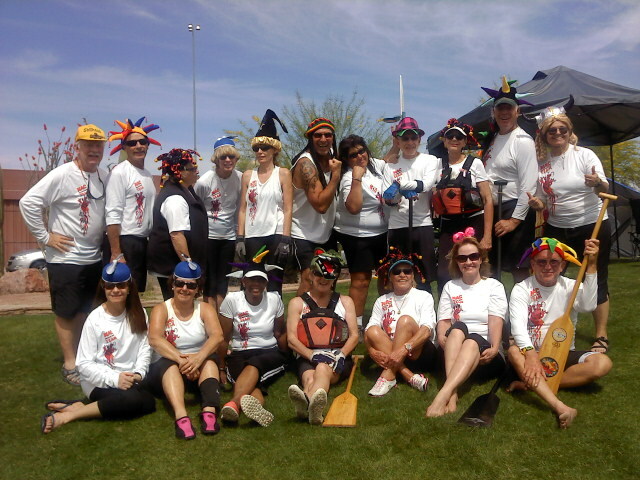 However, the fact that thousands of cancer survivors now paddle on Dragon Boat teams all around the world, is testament to more than just its physical benefits. It’s also about being part of a team; doing something strong and competitive. All those on a Dragon Boat team have their own unique stories, but once the cry of “paddles up” is heard, the team becomes one. All blades hitting the water in perfect unison, teammates and friends digging deep and pushing hard to shave that extra second off their time. We encourage not only breast cancer, but any cancer survivors–men and women–to visit us and see what it’s all about.